A sequel to the original Zak McKracken game. The game is available in English, Spanish, Russian, French, German, Italian, Portuguese, Dutch and Norwegian. I love the first Zak Mc Kraken game, and I enjoyed playing with him again. But the puzzles and the dialogs were truly not enough worked. Overall, I didn't enjoy this much. This game, unlike the original Zak McKracken, is quite linear and short. The story is quite typical (Rescue your girlfriend, quite a departure from the original and bizarre plot of the first game) and the puzzles were easy. However, I found that some dialogs were quite good. The Game seems to be programmed by a very young person... There was no story-line, no atmosphere. The puzzles were pointless an you got no hints within the Game, what to do. The grafics are very good. But you can see, that they are ripped. Well, I'm sorry to say this but I was rather disappointed in Zak2. It lacked the atmosphere of Zak1 where you could just start by messing around with things (finding your remote, paying your phone bill, buying LOTS of things at the store etc). There are many things visible on-screen that aren't hot spots (such as the shredder switch near the sink, and all items on the left shelf of the store). And there are far too many standard responses ('it doesnt seem to open' etc), and sometimes you don't even get a response at all. Finally, all older LucasArts games have some sort of keyboard control (i.e. QWE/ASD/ZXC for the nine commands would do it) this would improve playability. In my opinion this simply doesn't live up to the name of Zak. If you are a fan of the first game or similar games (i.e. 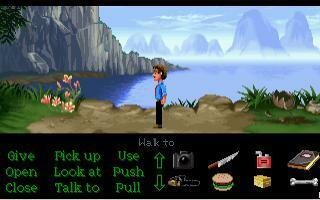 Monkey Island, Maniac Mansion), then this is definitly up your alley. I found the dialogue to be quite on par with the previous Zak game, and the puzzles to be even more logical this time around. Only complaint is that the game is rather short. An experienced adventurer will have little to no trouble beating this game in under an hour. However, it is still an ideal sequel! Not bad, but having LOVED the original, I hoped for more. My major complaint is that for a while, I felt like there were too many places to go to where there was nothing I could really do. Had the game led me more in the right direction more often than not, I would have enjoyed it far more. Still, there were something I really enjoyed here. A lot of the little things in the game (in-jokes from the original, mostly... as well as the number of frames in the Star Wars movie...) helped it out. If you loved the original, I still think it's worth playing. I was disappointed after waiting for an english translation AND the dead link to be fixed. The graphics are good but the dialogue and plot wasn't. If the general plot is meant to be good, it took too long to get started. Therefore I got bored and ended up deleting the game. Just coz a game has good graphics doesn't make it a good game! As a Zak McKraken and Lucasfilm Games Fan it was a must for me to play this game. The Grafics are nice paintet and it looks like the Amiga Versions of Zak McKraken. The Game Play ist the same like the original and the story is good. If you speak German and like Zak McKraken or other Lucasfilm Titels this Game is a must!